The Santa Clarita Valley Sheriff's Station counts on help from the community to solve crimes. One way Santa Clarita Valley residents have been getting involved is by submitting tips through “Los Angeles Regional Crime Stoppers," and over the last year, tips to Crime Stoppers have been of tremendous assistance and helped lower crime. SCV Sheriff's deputies and detectives arrested seven people within the last two months based on Crime Stoppers tips submitted by the public that were forwarded to the sheriff's station. A total of $850 will be paid out to the tipsters for providing information that assisted with the arrest of the suspects. "We need the community's help," said Crime Prevention Sergeant Dan Dantice. "Essentially, they are our eyes and ears out there. Our residents are very vested in their community, and they want to keep it a safe place to raise their families." One reason Detective Bureau Lieutenant Ignacio Somoano thinks that people call Crime Stoppers, instead of the sheriff's station directly, is that callers don't have to give their names to Crime Stoppers. "It's all completely anonymous," said Somoano. "Any tip, any piece of information that anybody knows, it’s very helpful that they get it to us because it could be the key piece of information that we need." 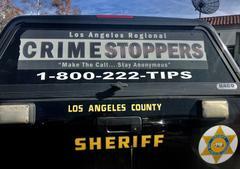 LA Crime Stoppers ensures that tipsters will remain anonymous. If you know something that might help Santa Clarita Valley Sheriff's solve a crime, you can give an anonymous tip to LA Crime Stoppers by visiting their website at www.lacrimestoppers.org or calling 1-800-222-8477.